Our goal is to provide the highest quality products at the best pricing. Please see below for commonly asked questions and our policies. Check back closer to the Holidays for delivery information. Please allow extra delivery time during Winter Weather. Any Questions ? Please Call Us at (610)-265-4277 and We will assist you in choosing the ship method to get you your order ON TIME ! We also offer Gift Certificates - emailed immediately to recipient upon payment if you miss the shipping deadlines. How Can I Contact DMD Collection? Our customer service department is open Monday through Friday, 9 a.m. to 5 p.m. EST. You can reach us by telephone at (610)-265-4277. Will My Credit Card Information Be Safe and My Order Processed Securely? We process all orders through a secure ordering system which uses industry standard Secure Socket Layering (SSL) encryption. Your information is transmitted securely over the internet in encrypted form – it cannot be accessed by third parties. DMD Collection does not store your credit card information. Sales tax collection and payment is required on all orders shipped within Pennsylvania. We are committed to offering you the lowest possible prices. If an item you have purchased from our website is reduced in price on our website within 2 weeks (14 days) of your order date, we will gladly adjust the sale price for you. We can only make one adjustment per item and the adjustment will be in the original form of payment. Postage pricing after your order is shipped is not adjustable or refunded. Special discounts and promotion codes are not valid on prior purchases. DMD Collection respects your privacy. We do not sell, lease or rent any of your personal information to third parties. We may use your information internally to contact you regarding an order you placed; reply to an email you sent us, notify you of sales and discounts or send requested newsletters. When Will My Order Ship? How Soon Will I Receive My Order? Most orders are shipped within 1 to 2 business days after receipt and processing unless otherwise notified. Orders placed on weekends and holidays are processed the next business day. You will receive an email notifying you your order was received and processed and an email notifying you your order has shipped including tracking details. We sometimes ship orders requiring signature confirmation at delivery. When signature confirmation is used, this service is at no additional charge to you. We will email you notifying you a signature is required for delivery and an estimated delivery date. Delivery time is determined by the ship method chosen at checkout. Ship methods include USPS Priority, UPS Next Day, UPS 2nd Day, and UPS Ground Delivery. We are also happy to offer free shipping on all orders over $ 25.00. When you choose free shipping your order will ship via USPS First Class Parcel Service. Estimated delivery time for free shipping is 5 to 7 business days. Your ship to address will determine final arrival date. Free shipping is valid only when you choose free shipping at checkout. If you need your order quickly or by a specific date – please see your express shipping options at checkout. Please contact us if you have any questions or concerns on receiving your order by a specific date. Where Does DMD Collection Deliver? DMD Collection ships to the 50 states of United States of America. We ship to the P.O., APO and FPO Box addresses via USPS Priority Mail only. We package items in a polybag with anti-tarnish tab; we then place your item in a blue jewelry pouch. Your pouched item is placed in a gift box. We 100 % inspect your product before shipping to ensure your order meets our strict quality standards and meets your expectations. If, for any reason, you are not satisfied with your purchase within 30 days of the postmarked ship date of your order, you may return any unused item for an exchange/replacement or credit (in the original form of payment minus shipping charges). Please package your item securely and include a copy of your original packing list with your request for exchange or credit clearly noted. All returns are processed within 1 to 3 business days of receipt at our location. DMD Collection will send you email notification your return was received and processed. You will receive an email with shipment tracking details when your exchange/replacement orders ships. Custom design, engraved and made to order (personalized) items are not returnable. DMD Collection is not responsible for lost or damaged return shipments. We recommend you ship your return package with a carrier that provides tracking and insurance. Returned merchandise is the responsibility of the sender until shipment is signed for/received by DMD Collection. DMD Collection will not be responsible for return postage costs. Shipping fees are non-refundable. 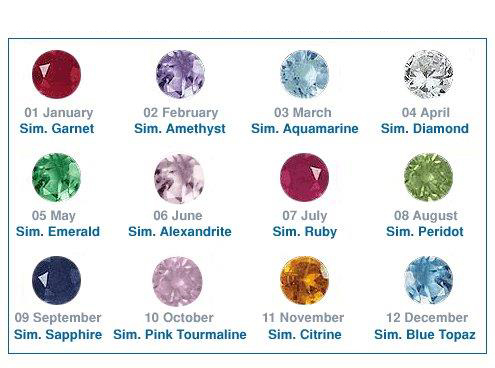 What Color Is My Birthstone? Click Here for ring size measurement instructions. Please double check your ring size before ordering. Be certain to follow browser instructions to obtain accurate ring size. How Do I Keep My Jewelry Looking Clean and Shiny? Please Click Here for jewelry care and cleaning tips. We suggest you store your sterling silver jewelry with the anti-tarnish tab included with your item. DMD Collection offers gift certificates in any denomination for the hard to shop for recipient. Please Click Here to access our easy to follow gift certificate ordering page. Gift certificates are easy to redeem, enter name and voucher as it appears on the gift certificate at checkout. Gift certificates are not redeemable for cash. The value of the gift certificate can not exceed the gift certificate dollar amount. Do You Charge for Engraving? Engraving is free of charge where offered. We can engrave letters, numbers and most symbols unless noted in item details. Please note the character limit listed for each item, this is the total of letters, numbers, most symbols and spaces. The height of the text engraved is dependent on the length of the engraved message you request and the dimension of jewelry piece purchased. We will ensure your message is easily readable by engraving in the largest font appropriate for your message. DMD Collection reserves the right to decline to engrave any message they deem vulgar, profane or discriminatory. All website content is the property of PHD Industries, Inc., www.DMD Collection.com. Any use of material from this website is strictly forbidden. Any copying, publishing or transfer of materials from this website is strictly prohibited. By visiting www.DMDCollection.com, you are accepting the terms and conditions as listed. Please Click Here for DMDCollection.com terms and conditions.